I ran out of Frank’s Hot Sauce recently. This made me rather sad but as I had a pretty healthy stock of firey and delicious condiments at my disposal (including the superb ‘Holy F**k’ offering from The Rib Man) I reasoned that I was fine for a goodly while. However, there were more and more occasions when the sort of sauce I craved was of the Frank’s variety and quite frankly (see what I did there?) nothing else would do. 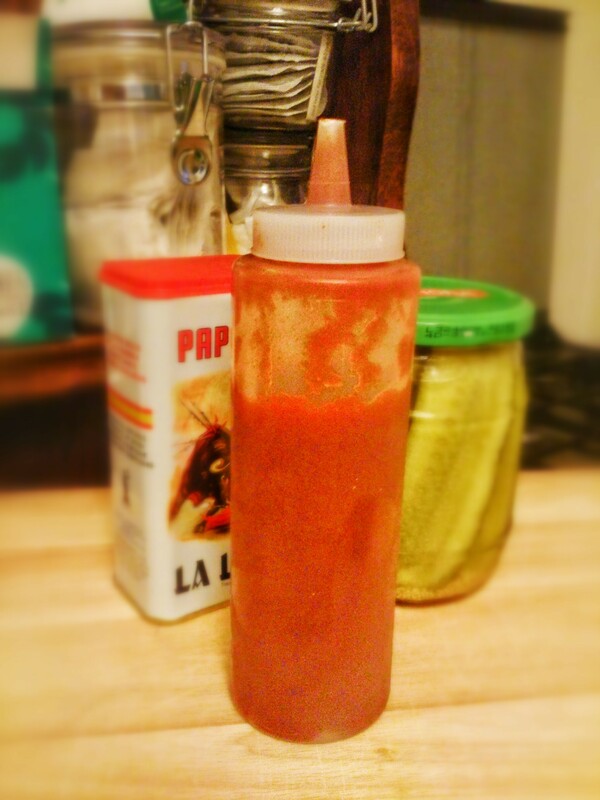 And my tabasco was also running low. Obviously I could have popped out and simply bought some more of my required delight but I wondered if it was possible to recreate something similar at home with the last of my crop of chillies. A quick scan of the internet revealed a goodly number of so-called ‘copycat’ recipes and so I decided to go for it and used a combination of two or three. However I didn’t have the 18 cayenne chillies specified so I used a heady mix of (annoying mild) Scotch Bonnets, cayennes, jalapenos, and a dried habanero just for larks. The results were pretty awesome I have to say – hot, pleasingly zingy, addictive – and the recipe itself was actually pretty simple so it will be easy to restock when I need to. I didn’t bother taking the seeds out but if you want the exact consistency of the legendary Frank’s then you can deseed the chillies first or pass the mixture through a sieve after cooking. If you have an extractor fan in your kitchen then this will be most beneficial. Mix the vinegar, salt, garlic powder, sugar together in a saucepan then add your chillies and garlic. Bring to the boil and then reduce the heat to a simmer and let it blip and bubble away for 20 minutes or so. This is where the extractor fan really is your friend. Transfer the mixture to a blender/food processor and blitz into a paste. BE CAREFUL!!! The mixture is not only viciously hot it is also sinus-rippingly aromatic. Once you have blended to your preferred consistency (and sieved if you like), return to the pan and simmer for a further 15 minutes, stirring occasionally. Transfer to a sterilised bottle and let cool. It will be awesome straightaway but I urge you to let it sit and mingle for at least 24 hours before using. Once you have started using your sauce, store it in the fridge to keep it happy. Happy saucing! 1 x 400 g tin of your choice of beans – kidney/pinto etc. Heat about a tablespoon of oil in your largest casserole pan on a medium heat and add your chopped bacon/pancetta. Stir it about and let it sizzle and sing until is coloured and crispy. Once the bacon is cooked, add the cumin, paprika, oregano, bay and onions and reduce the heat slightly. Fry for 10 minutes, until the onions have softened and your kitchen is filled with a wonderful aroma of spices and bacon. Mmmmm…. Deseed (if you like) and chop up half the fresh chillies and then slice up the rehydrated ones and add them to the onion mixture along with the chopped fresh chilli, the cinnamon stick, sliced garlic, and season with salt and pepper. Add the coffee, sugar, and tomatoes, breaking them up with the back of a spoon. Stir and then add the chocolate, stirring until it has oozed and melted in. If you taste the stew now it will predominantly taste like chocolate – fret not, it will all mix and mingle while it cooks. Add the pieces of stewing steak, cover with a lid and simmer for 2-3 hours, stirring occasionally. Depending on what meat you have used the cooking time will vary – check after a couple of hours and if your meat is falling apart it is done. If not, keep going! Alternatively you could put it into a low oven for about the same amount of time. When it’s all soft and unctuous (at least 2 hours later) use 2 forks or a potato masher to break the meat up and pull it apart. Once you’ve done this, add the chopped peppers, then drain and add the beans and leave to simmer with the lid off for around 30 minutes, stirring occasionally. Have a taste and season well – if you want more heat then add the rest of the sliced fresh chilli. Dollop a big spoonful of soured cream on to your chilli of joy and serve with rice, flatbreads or whatever carby delight you fancy. And it is perfectly acceptable to eat this with chips. Or over a jacket potato. Or half rice, half chips. I’m not judging you. This recipe is adapted from an amazing dish by the ever dependable Madhur Jaffrey – my parents only ever used her cookbooks when we were growing up and my Dad’s (signed) copy of Indian Cooking is coated in oil, spices, and memories. If using chicken legs, divide into thigh and drumsticks. Breasts should be cut in half and kept on the bone. Put the onion, garlic, ginger, almonds, peppers, chilli, cumin, coriander, turmeric, cayenne, and salt into a food processor and pulse until you have a thick, smooth paste. Put the oil in a wide pan over a medium heat and, when hot, stir in the paste and fry for 10-12 minutes, stirring to stop it from colouring. Your kitchen will start to smell amazing. Add the chicken, lemon juice, and pepper then add enough cold water to just cover the chicken. Stir and mix together then bring to the boil. Cover and turn the heat to low and let the curry simmer for 45mins to an hour, stirring occasionally, until the chicken is cooked and falling away from the bone. If you like, you can remove the pieces and shred the meat back into the sauce but I don’t bother. Adjust the seasoning as required. Remove the lid and turn up the heat to reduce your sauce – you can have it as thick or as runny as you prefer – then serve immediately with steamed rice and flatbreads. If you were doing this with fish, cook the sauce for about 45 minutes and reduce slightly before adding the fish – it will only take a few minutes to cook through. Hello everyone! I am so sorry for my absence from the land of Butisittasty over the past few months – as well as recovering from my jaunt in hospital I have been finishing my MA (now done – YAY!) which took up a lot of my time and all of my energy. But I’m here now so all the tasties can be had! Although I am still very tired. One of the things about recovery is that little things really can make a difference, and I found myself looking for dishes that were not only simple (well, maybe with the exception of the Pigs Trotters on Toast!!!) but which were comforting. Old cookbooks were dug out and old favourites were re-discovered. This dish is based on a brilliant Madhur Jaffrey recipe for spicy hard boiled eggs. My parents used to make a version of this every time we had a big party of friends over for a curry-fest and it was always the first to be gobbled up. Although it is good with eggs, the prawns add a wonderful flavour which, combined with the cream, create a decadent and almost bisque-like curry. You can substitute the cream for yoghurt if you like but you’ll be missing out – it’s totally worth the extra calories. You can use fresh prawns too if you prefer – just reduce the cooking time slightly. Heat the oil over medium heat in a large, non-stick frying pan then add the onions. Stir and fry until the pieces are just beginning to brown at the edges then add the ginger and chilli and stir fry for a minute or so. Now add the cream, lemon juice, cumin, cayenne, garam masala, tomato paste and chicken stock. Stir to mix thoroughly and then bring to a simmer. Taste and adjust the seasoning as necessary, then add the frozen prawns and stir the whole lot together. Cook over a medium heat for 5 minutes, spooning the sauce over the prawns until they are cooked through. By this time the sauce should be fairly thick. Garnish with the fresh coriander and serve with steamed rice and/or a load of flatbreads for dipping. As part of my birthday celebrations this year I decided to throw a bit of a US-style meat feast featuring things like brisket, ribs, wings, and cornbread. I have been using the dependable and excellent Pitt Cue Co. recipe for BBQ sauce for a couple of years now but I decided that a change was in order and, having sampled various sauces and dips at Grillstock 2014, I set about hunting down a new one. I’m slightly ashamed to say that I can’t remember which of the many BBQ sites that this recipe originally came from – if anyone finds it let me know and I’ll add a link. 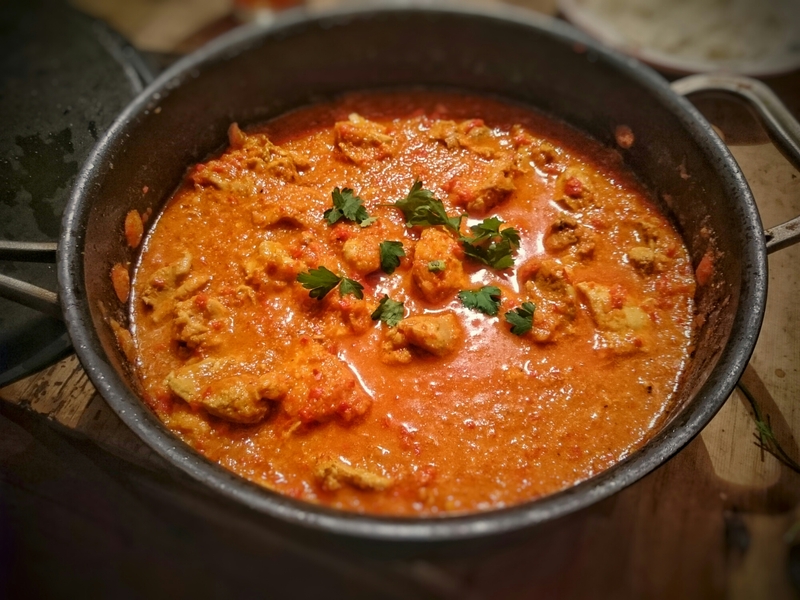 It is a really easy sauce to make and I’m definitely going to do a larger batch next time round as the richness and layers of heat and spice are rather addictive. I adjusted the amount of sugar to make a sweeter (and ultimately darker) sauce which set off the smoky, fatty ribs perfectly. And also went very well with the hot dogs we had for breakfast the next day…. NB – if you can’t get hold of liquid smoke don’t worry, the sauce is more than amazing without it. In a large saucepan gently heat the olive oil and add the garlic – keep it moving so it doesn’t burn and make everything taste of bitter nastiness. When the garlic is soft and fragrant, add all the rest of the ingredients and stir thoroughly to combine. Bring to the boil then reduce the heat and simmer for 10-15 minutes until it is thick and unctuous then decant into a sterilized jar or sauce bottle. Smother over any BBQ meat of your choice and feel very smug. This is one of my all-time favourite dishes to have for breakfast. It was created whilst camping in the glorious Vale of the White Horse a couple of years ago when my good friend Rich and I were musing on how we could posh-up our morning meal – we came up this and it is an absolute corker. In our humble opinion anyway. There are lots of recipes for kedgeree and I’m sure several are similar to ours – afterall, how many different ways can you make curried rice and smoked fish? We use hot smoked mackerel instead of the traditional haddock so we don’t have to worry about poaching the fish – likewise, packets of pre-cooked rice save time and washing up. This is a one-pot version (we only have a single gas stove when ‘under canvas’) but you can add as many processes and pans as you feel necessary – we sometimes get organised and hard-boil the eggs the previous evening but most of the time we do it this way. Whichever you fancy. Fill a saucepan with boiling water over a medium heat and pop in the eggs – cook for 6-10 mins depending on how runny you want the yolk to be. Remove the eggs and set aside to cool then empty the pan and return to the heat. Put a good slug of oil into the pan and heat gently then add the sliced onion and garlic, frying until soft and translucent but not too coloured. Add 1tsp of the curry powder at this point and stir vigorously until the onion and garlic are completely coated – if the pan seems a bit dry at this point add a touch more oil to loosen. Add the remaining curry powder to the pot of yoghurt, mix well, and set aside. Once everything is nicely curried, reduce the heat slightly and add the packet of cooked rice and mix the whole lot thoroughly then add the flaked mackerel and stir well. Keep an eye on the rice – a bit stuck at the bottom is fine but it will easily form a big, burnt mass if you’re not careful! By now your eggs should be cool enough to peel and chop – slice as fine or as chunky as you like and add them to the pan, stirring through to combine and then add the spicy yoghurt to the pan and combine the lot – seasoning to taste. Serve immediately – scattering chopped coriander as a gesture towards presentation if you wish! In a saucepan over a medium heat, add a splash more oil and begin to soften the onion then add the roasted chilli, garlic and tomato. Once everything is sizzling, add the ketchup, sugar, ras el hanout, water and seasoning and bring to the boil. Simmer for ten minutes or so then blitz with a stick-blender or food processor. Pass the sauce through a sieve into another pan – you should have a rich puree – and return to the heat. Taste and adjust the seasoning. It should be tingling and spicy – if it is too firey add more water and reduce as required.